Is scotch- neck a description of how someone’s neck looks who likes to neck scotch? I don’t see anything similar between Hitch’s neck and Edward Kennedy’s. Don’t call him ‘the Hitch’, please, for it is not his name. Hitch it is, and he was extremely handsome in his youth, now he is good for his age. Hope that’s not insulting. Certainly not meant to be. His writing is exhilaratingly lively and he has a brilliant way with words. Not in agreement with his neo-con views on fighting the fight against terrorism using conventional wars; but he is an honest and passionate man; qualities which I deeply admire. This unforgiving illness is devastating and I hope he does not suffer massively. I, too read everything he writes that I am aware of and love to watch him on youtube arguing the anti-theist stand which I am not able to fully embrace. There is no evidence of a god I say, but until there is proof offered that there isn’t one I’m in the agnostic camp. The atheist alternative does not yet offer the science to provide me with the story of how the world began. I accept the Big Bang but what happened before that? 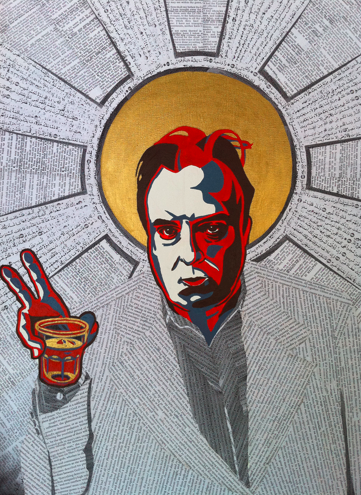 I get a daily Google Alert about Hitchens, which brought me to your site today. I love the painting! @Susan. Thanks for the commentary! In a world of numerous Hitches (Hitch the rockband, Hitch the 2005 Will Smith film, a tow hitch…) I sometimes feel obliged to get all specific when referring to my favorite amongst these, “The Hitch”. Scotch-neck is a bit misleading, as it’s more like Scotch-jowls. Compare those pictures again with Teddy, then Hitch with his brother, and you’ll see what Scotch does to men as the years press on. oh it’s just so good. Excited for Mr. Rushdie. Your portrait is incredible (do you sell prints? ), and your kind, instructive response to Susan regarding how things began is a credit to free thinkers. By the way, we call him Hitch or The Hitch or Christopher at our house, and I do not think he would mind. In a Wildean sort of way, he may even believe that the only thing worse than being misnomered, is not being talked about at all. Get ready everybody: PRINTS ARE ON THE WAY!